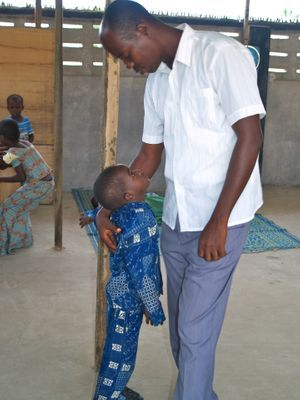 In 2011, Patrick Nwodobeh, school teacher, chicken farmer, and spiritual man, answered a call from God, which he heard through prayer, and launched the Savior Children Foundation, an organization dedicated to bettering the lives of children in and around the community of Kasoa in Ghana, Africa. The Foundation was built to help bridge the gap between the rich and poor, gender inequality and human rights, and to provide a landscape where every child thrives with exposure to good nutrition, education, and recreation. At its heart, the Foundation provides a home for more than 40 children but it’s also much more than that. It’s a school where children are taught fundamental skills that will help them grow and take care of others who are vulnerable. It’s a recreation facility where children can play. It’s a home where children are loved. At first, the work of building the Foundation rested solely on Patrick and his family’s shoulders. Together, they fed the homeless, sick, and needy. Children slept on mattresses on the floor. Every morning, mattresses would be moved and the children’s bedroom would transform into a makeshift classroom. In his spare time, Patrick would build walls and other fundamental supports to expand the place into a space that could accommodate his vision to care for children. Gradually news of the Foundation spread. Volunteers arrived and proper structures, such as classrooms, dormitories, showers, and a new kitchen were built. Donations supplied vital materials such as food and building supplies. With this essential support, Savior Children Foundation grew and the children’s quality of life improved. On Dec. 31, 2013, the Savior Children Foundation was forced to relocate. The current location of the orphanage has undergone a major transformation in a short period of time. In a matter of months, with the help of donations, volunteers, and lots of hard work, the orphanage now has a new school, functional showers and toilets, a kitchen, and is currently working on new dormitory rooms for the orphans. There are hopes to purchase a much needed school bus that will fulfill the children’s transportation needs. Currently, the property housing the orphanage is leased. The ultimate goal is to purchase a plot of land to ensure the long term sustainability of Savior Children Foundation. Once the foundation is on its own land, the foundation will invest in livestock, plant cash crops and also purchase a fish farm. All of these would provide an ongoing source of food for the children and will also act as a means of income. The Savior Children Foundation aims to establish a scholarship program for the older orphans to ensure they continue to receive a good education past Junior High 3, provide health care plans for teachers and staff, and create an ICT suite where the students and community of Kasoa can work on computers.